Minnie Riperton, A Tribe Called Quest, 2pac, J Cole, Kutmasta Kurt and more. One of our Beat Junkie Record Pool Ambassadors, the talented Dj Nick Bike has his own radio show called “World Famous Wednesdays” on SaveOnRadio.com. He has another new mix for you to listen to. His new & past episodes features music & his own special edits that’s featured on our record pool for your listening pleasure. DJs, if you like what you hear, go to www.beatjunkies.com & sign up! Big ups to Nick for always throwing it down!!! (3/14/18) with AGALLAH THE DON & M.E.D. Download the Dash Radio App for free or listen to us on the web: www.dashradio.com. the Netherlands, make sure you check out DJ Dynamite! A new episode from one of our Record Pool Ambassadors, the talented Dj Nick Bike & his radio show “World Famous Wednesdays”on SaveOnRadio.com. We will start posting new & past episodes that features music & his own special edits that’s featured on our record pool for your listening pleasure. DJs, all the songs in this mix in in our record pool; if you like what you hear, go to www.beatjunkies.com & sign up! The Funky President does it again!! “A project I started years ago but never finished. Here are some of the tracks that are completed. A new episode from one of our Record Pool Ambassadors, the talented Dj Nick Bike & his radio show “World Famous Wednesdays” on SaveOnRadio.com. We will start posting new & past episodes that features music & his own special edits that’s featured on our record pool for your listening pleasure. DJs, all the songs in this mix in in our record pool; if you like what you hear, go to www.beatjunkies.com & sign up! The Funky President, J.Rocc is a mad scientist as he came up on some crazy concept of combining 2 different artists that you would never thought of putting together. SADE AND MOBB DEEP?!? C’MON SON! It’s dope!! Peep it out!! Our very own Beat Junkie Record Pool Ambassador & Toronto legend Dj Grouch of the mighty Turnstylz Crew along with his associate Dj Ritz have made a new mix joint for you to light one up! It’s called the “Up In Smoke” Mixtape. AUDIO: “ESSENTIALS WITH MIKE NARDONE” (11/11/17) w/ special guest DIVINE STYLER! It is an honor to have the legendary LA Hip Hop Radio personality, Mike Nardone return to the airwaves on Beat Junkie Radio. He returns to his roots by debuting his new show called “Essentials” on Beat Junkie Radio. If you’re not familiar with Mike Nardone, he was the first person to start up a college Hip Hop radio show in 1987 at KXLU (Loyola Marymount) in Los Angeles called “We Came From Beyond” as well as having a show on the defunct 92.3 The Beat called “Da Joint” with King Emz. Mike is the West Coast counterpart of the legendary NY Radio Duo, Stretch Armstrong & Bobbito Garcia. This particular episode, he has the legendary Divine Styler as a special guest! The audio is a 2 part link. Essentials with Mike Nardone will NOW be airing every 2nd Saturdays of each month from 4-6pm on Beat Junkie Radio, exclusively on Dash. You can listen to Mike’s show by either downloading the FREE Dash Radio App from ITunes or Google Play or listen on the web: www.dashradio.com. Meyhem Lauren & Dj Muggs – “Gems From The Equinox” & Defari – “Rare Poise” AVAILABLE NOW! UPDATE! Due to Mixcloud‘s “Licensing Restrictions” in the US, we had to uploaded to Dropbox instead. You can either listen or download the audio by clicking on the link. Enjoy! TONIGHT (11/10/17): SNAPBACK LBC w/ special guest DJ GRAVITY ONE! Tonight (November 10th) is another installment of Snapback LBC at The Federal Underground in Downtown Long Beach. This week’s special guest is Gravitiy One plus residents Dj Icy Ice, Dj Remark, & Dj Orion + hosted by Toquan Tha MC. If you love classic Hip Hop & R&B, this is a perfect way to kick off your weekend! AUDIO: “SOUNDCHECK” – HAPPY BIRTHDAY J.ROCC, MADLIB, PLANET ASIA, PHAROAHE MONCH, BISHOP LAMONT, THE ALCHEMIST, & OHNO! Happy Birthday to J.Rocc, Madlib, Planet Asia, Pharoahe Monch, Bishop Lamont, The Alchemist, & OhNo! AUDIO: “ESSENTIALS WITH MIKE NARDONE” (10/14/17): ‘COVERS’ EPISODE! It is an honor to have the legendary LA Hip Hop Radio personality, Mike Nardone return to the airwaves on Beat Junkie Radio. He returns to his roots by debuting his new show called “Essentials” on Beat Junkie Radio. If you’re not familiar with Mike Nardone, he was the first person to start up a college Hip Hop radio show in 1987 at KXLU (Loyola Marymount) in Los Angeles called “We Came From Beyond” as well as having a show on the defunct 92.3 The Beat called “Da Joint” with King Emz. Mike is the West Coast counterpart of the legendary NY Radio Duo, Stretch Armstrong & Bobbito Garcia. It is our pleasure and honor to welcome aboard OJ, Nikobeats, & Cazal Organism and their new show “Assorted Flavas” on Beat Junkie Radio! “For the very first episode, us, the creators and hosts of Assorted Flavas are providing sounds for the entire show with 3 sets full of heat. Shout out to Rhettmatic for welcoming us to Beat Junkie Radio! We’re back the last Friday of November from 3-5pm PST with a couple special guests. Download the DASH Radio app for iOS, Android and other mobile devices. AUDIO: “A STABLE SOUND” w/ CUT CHEMIST – EPISODE 23: 1 YR ANNIVERSARY/BDAY & DJ LIVE FROM BJIOS! 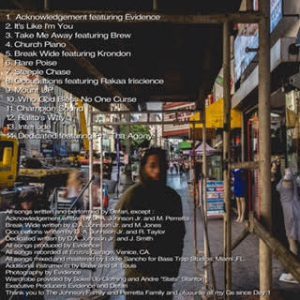 NEW DEFARI – “RARE POISE” ALBUM PRODUCED BY EVIDENCE! OUT NOW! It’s been a while since we’ve heard any new music from the legendary LA wordsmith Defari……well now he’s back! He drops a new album called “Rare Poise” produced entirely by the one & only Evidence (who also happens to handle the album photography duties). The album features Krondon, Rakaa Iriscience, Phil Da Agony, & Evidence. For all our Record Pool Members, we have some select songs from Rare Poise. Go to our Record Pool NOW to have them in your crates! SAT (10/28/17): THE HAUNTED HOUSE OF SCRATCH AT BJIOS!! The Haunted House of Scratch! We’re having our regular Open Turntable session, but Halloween style! Come in your costumes and enjoy Donuts provided by DREAM Donut Truck! Students + BJIOS Members are FREE, please register via your BJIOS profile. We are also hosting a free 30 min scratch workshop at BJIOS! It’s free! Space is limited to 12 people. This workshop is for new attendees only. If you are unable to attend after you have RSVP;’d please contact us. Tonight (October 27th) is another installment of Snapback LBC at The Federal Bar in North Hollywood. This week’s guest in honor of Halloween, it’s the one & only Dj Wrex + residents Dj Icy Ice, Dj Remark & Dj Orion & host: Toquan The MC. If you love classic Hip Hop & R&B, this is a perfect way to kick off your Halloween weekend! SATURDAY (10/21/17): CUTFEST LA AT THE BEAT JUNKIE INSTITUTE OF SOUND! FRIDAY (10/20/17): DO IT 3 YEAR ANNIVERSARY w/ special guest DJ MELO-D! NEW FOUNDATION CLASS STARTING TODAY AT BJIOS! YOU CAN STILL SIGN UP! New Foundation Track Open and starting this today 10/16 7:30-9pm! Only 12 spots per class, if you’d like to join contact us! Tonight (October 6th) is another installment of Snapback LBC at The Federal Underground in Downtown Long Beach. This week’s special guest is Mr. Swiff plus residents Dj Icy Ice, Dj Remark, & Dj B-Stang + hosted by Trek Life. If you love classic Hip Hop & R&B, this is a perfect way to kick off your weekend! SAT. (10/7/17): “A STABLE SOUND” – A LIVE RECORDING WITH CUT CHEMIST & SHORTKUT FROM BJIOS! Come though and wish Cut and Shortkut a Happy Birthday and vibe out with them, more special guests TBA, LIVE from the LONGTAGON! Current BJIOS Students and Members are Free, please contact BJIOS to sign up! FRIDAY (10/6/17): FUTURE PRIMITIVE SF 20 YEAR ANNIVERSARY w/ CUT CHEMIST & DJ SHORTKUT! Friday (October 6th) is the Future Primitive Sound Session 20 Year Anniversary featuring Cut Chemist & Dj Shortkut at the Great Northern in San Francisco. With special guests Dj Platurn (45 Sessions), Gordo Gabeza (Motown On Mondays Founder), & Miles Medina (The Goldie Awards 2017 World Champion). This is an event that you don’t want to miss! October sign ups for our DJing For Kids Class are now open! Deadline to sign up is OCTOBER 5TH! 2 of the most innovative DJ’s of the last two decades, rocking the party as 1! Los Angeles, this is something you don’t want to miss out! SAT. (10/14/16): 2ND ANNUAL “SIP N SCRATCH” LADIES ONLY WORKSHOP w/ DJ SHORTEE at BJIOS! Ladies, we’ve got another Sip n’ Scratch coming up, Saturday Oct.14th 6-10pm at The Beat Junkies Institute Of Sound! We’ve got the incredible Dj Shortee coming back to lead the way at this ladies only scratch workshop and Vino And Vibes coming through with the wine! RSVP IS A MUST! LIMITED SPACES AVAILABLE! EVENT: MONDAY (10/9/17): GLENDALE TECH WEEK AT BJIOS! Join us Monday October 9th from 5-8pm at the Beat Junkie Institute of Sound for an up close look inside the world of DJ’ing. Take a tour of our facility and learn how to DJ on state of the art equipment from the Beat Junkies! Light appetizers and cocktails will be served, be sure and reserve your space! Come celebrate the launch of Glendale Tech Week 2017 with LA’s very own Beat Junkies! This is a private event and BJIOS will be closed. RSVP is required as space is limited, click on the RSVP link to join! THANK YOU TO DJ K-SWIZZ FOR VISITING BEAT JUNKIE INSTITUTE OF SOUND! Huge thank you to the future legend DJ K-Swizz (& his father Dj Reminise) for being our special guest and an inspiring our advanced DJing for kids class! AUDIO: J.ROCC’S “ADVENTURES IN STEREO” w/ DAMIAN “JR GONG” MARLEY! This is a past recording of “Adventures In Stereo” radio show few months ago. The Funky President J.Rocc brings in the legendary Damien Marley. J.Rocc’s radio show is now every Friday from 8-10pm on 90.7FM KPFK in Los Angeles or listen on the internet: www.kpfk.org. MONDAY (9/4/17): MOM LA’S “CALIFORNIA SOL” w/ RHETTMATIC, MUSIC MAN MILES, SEANO, DJ EXPO & MORE! Join LA’s favorite Monday night weekly dance party, MOM LA (Motown On Mondays), to celebrate your Labor Day in style, ‘Upstairs’ on the rooftop of Ace DTLA! Soak in the sunshine & lovely view of the Downtown Los Angeles skyline with the MOM LA Players, plus special guests, serving up feel good music to feed your soul and keep you movin’ and groovin all day long. For the thirsty & hungry party goers, the rooftop bar will have a fine selection of craft cocktails, draft beers, and gourmet bites for offer. All sun worshipers & water lovers are invited to enjoy the rooftop pool area. Grab your dancing shoes, tell a friend, and get ready for a funky good time! Spinning Motown, Soul, Funk, Disco, House, & World sounds. Originals, remixes, re-edits, and more! SAT. (9/9/17): THE BJIOS TECH SHOP GRAND OPENING by OPEN FORMAT LA & JESSE DEAN DESIGNS! Saturday (September 9th) is the Grand Opening of the BJIOS Tech Shop by Open Format LA & Jesse Dean Designs. We officially open up for all you Portable Turntablists where you can get your portable turntables purchased, modified, & repaired at. In celebration of the grand opening, we will be having Open Turntables, Food Trucks, & many more. SUNDAY (9/3/17): RHETTMATIC AT THE GOODNESS – DENVER, CO! This Sunday (September 3rd) during Labor Day Weekend, Rhettmatic will be spinning at The Goodness, all happening the Meadowlark’s Patio in Denver, CO. It’s a daytime event from 3-9pm with resident Dj Lowkey + special guests Dj Morsecode, Dj Equal, & Dj Mikey Fresh. It’s the last Goodness party of the Summer. If you are in the Denver area, this is the spot to be! SEPT 2ND & 3RD: DILATED PEOPLES AT THE DRY DIGGINGS MUSIC FESTIVAL! September 2nd & 3rd during the Labor Day Weekend, Dj Babu will be joining his group Dilated Peoples at the Dry Diggings Music Festival. Also on the bill is Dilated’s own Evidence, Anuhea, Spawnbreezie, & many more. If you want to get your camping on & watch musical acts, this is the place to be. This Labor Day Weekend, our DJ school, the Beat Junkie Institute Of Sound will be CLOSED on Saturday, September 2nd & Monday, September 4th, but will be back in effect on Tuesday, September 5th! Enjoy your Labor Day Weekend everyone!! AUDIO: J.ROCC’S “ADVENTURES IN STEREO” w/ special guest DJ QUIK! This is a past recording of “Adventures In Stereo” radio show few months ago. The Funky President J.Rocc brings in the legendary Dj Quik. J.Rocc’s radio show is now every Friday from 8-10pm on 90.7FM KPFK in Los Angeles or listen on the internet: www.kpfk.org. FRIDAY (9/1/17): RHETTMATIC at “DILLA’S DONUTS” POP UP/DELICIOUS PIZZA LA! (Los Angeles, CA): September 1st & 2nd,Delicious Vinyl presents Dilla’s Donuts L.A. Pop Up Shop. Join us at Delicious Pizza Cafe (6601 Sunset Blvd.) for donuts, music and more. Dilla’s Delights, the Detroit based doughnut shop launched by Herman Hayes, uncle of the late, great legendary hip-hop producer J Dilla, will be providing an assortment of organic and aptly named donuts for the first time in Los Angeles for your snacking pleasure; McNasty Macaroon, Blackboottom Beatstreet Blueberry, D-Lime Glaze, Rasul Wasi aka the Titus Conant Garden Glaze, Fantastic Fritters, Cakeboy Chocolate & more! Along with the donuts, exclusive J Dilla merchandise and vinyl releases will be on sale. Delicious Vinyl recording artist Frank Nitt (Frank-N-Dank, Yancey Boys) will be hosting live DJs and MCs all weekend, including DJ Rhettmatic on Sept. 1 at 8pm. Soul Circle Radio will be webcasting live on Sept. 2 from12pm-2pm. “SCRATCH PACK” PACKAGE LESSONS AT THE BEAT JUNKIE INSTITUTE OF SOUND! The Beat Junkie Institute Of Sound is offering a special “Scratch Pack” for all you Scratch DJs! We’re offering classes for Intermediate Scratch Training & Advanced Scratch Training. These classes are for those that want to focus on maintaining & improving your scratching skills. Our rotating instructors are D-Styles, Babu, & Melo-D, 3 of the best Scratchers in the world! If you’re interested in getting your skills up in Scratching, you can sign up/ask for information at info@beatjunkiesound.com. ASSESSMENT IS REQUIRED FOR INTERMEDIATE! VIDEO POST: A TRIBUTE TO DJ AM BY DJ MELO-D! On this day, August 28th 2009, we lost the incredible DJ AM. In rememberance of our brother and all of his contributions to the art form and the DJ community, here is a tribute from our very own DJ Melo-D in honor of one of the greatest to ever do it on the 2 turntables. Rest In Peace Adam Michael Goldstein aka DJ AM. AUDIO: “ESSENTIALS” w/ MIKE NARDONE (JULY 8, 2017) – R&B 1984-1986! It is an honor to have the legendary LA Hip Hop Radio personality, Mike Nardone return to the airwaves on Beat Junkie Radio. He returns to his roots by debuting his new show called “Essentials” on Beat Junkie Radio. If you’re not familiar with Mike Nardone, he was the first person to start up a college Hip Hop radio show in 1987 at KXLU (Loyola Marymount) in Los Angeles called “We Came From Beyond” as well as having a show on the defunct 92.3 The Beat called “Da Joint” with King Emz. Mike is the West Coast counterpart of the legendary NY Radio Duo, Stretch Armstrong & Bobbito Garcia. This particular episode, Mike is playing R&B soul from 1984-1986. Essentials with Mike Nardone will be airing every 2nd Saturdays of each month from 4:30-6:30pm on Beat Junkie Radio, exclusively on Dash. You can listen to Mike’s show by either downloading the FREE Dash Radio App from ITunes or Google Play or listen on the web: www.dashradio.com. AUDIO: SOULECTION RADIO EP. 312 feat. THE BEAT JUNKIES! Dj Rhettmatic of the World Famous Beat Junkies has been DJing for well over 20 years. A Dj champion, member of The Visionaries, Crown Royale, the Cypress Junkies and the Dirty Disco Squares, Rhett has been producing for just about the same period of time, creating backdrops for artists from Aloe Blacc to Ras Kass on well over 50 releases. And now it comes time for the OG staple of the West Coast to step out with his own full-length instrumental project. May 19th, 2017 you will find out, if you didn’t already know, that Rhett Got Beats. At 18 tracks beatin’ down the block, with a bonus feature from Hieroglyphics’ Opio and Pep Love, this will fit nicely in your Street Corner Music collection. In this video footage, Rhettmatic is in his home studio, which he calls it the “Sound-O-Matic Lab”, playing beats (old & new) from all the various machines that he uses to produce with: the classic E-MU SP1200 & the Akai MPC2000 Drum Machine Samplers as well as his current production tool, Propellerhead’s Reason Software. You can actually hear the progression of his production throughout the years with each music equipment, even with some beats that he forgot that he made. “Rhett Got Beats” presented by Houseshoes on Street Corner Music available NOW! Our very own Dj Babu & his son Nikobeats were featured on the NBC LA Channel 4‘s “Life Connected” series in honor of Asian Pacific Heritage Month. 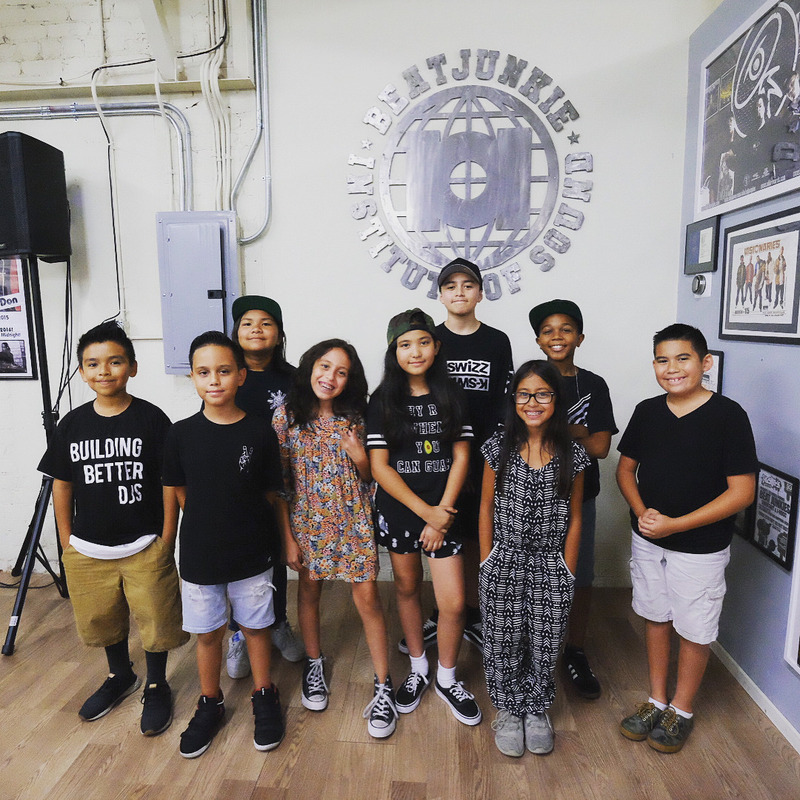 They were interviewed during the official Grand Opening of the Beat Junkie Institute Of Sound in Glendale this past April. Thank you to Hetty Chang for the interview! The collaboration of T-Dot’s Finest repping for One of Hip Hop Duos of All Time, Gangstarr! Dj Starting From Scratch takes you on the ultimate musical journey showcasing the greatest songs/features of Guru & Dj Premier & our very own Record Pool Ambassador, the legendary Dj Grouch gives you the ultimate retrspect by cutting up some of Gangstarr’s greatest Breaks/Breakbeats. All this combined gives you THE ABSOLUTE GREATEST TRIBUTE TO THE GANGSTARR. that you’ll ever get your hands/ears on!!! You know it’s also legit when Preemo himself drops an official drop for the mix. Rest In Peace Gifted Unlimited Rhymes Universal aka The Guru! SAT (4/15/17): GRAND OPENING OF THE BEAT JUNKIE INSTITUTE OF SOUND! Please join us as we commemorate our 25th anniversary & celebrate the opening of our very own DJ School & Training Facility the Beat Junkie Institute Of Sound! Come thru for a tour and learn more about our school and our upcoming semester starting in May! While your at it, enjoy a day of DJ sets, mini workshops, open turntable sessions, portable turntable sessions, record vendors, raffles & giveaways, as well as food & drink provided by Locol and White Rabbit Truck. Beat Junkie Institute of Sound coming in Spring 2017 for more info go to www.beatjunkiesound.com. The homie DJ Manwell recently was apart of a dope collaboration with producer extraordinares 14KT & Stro. 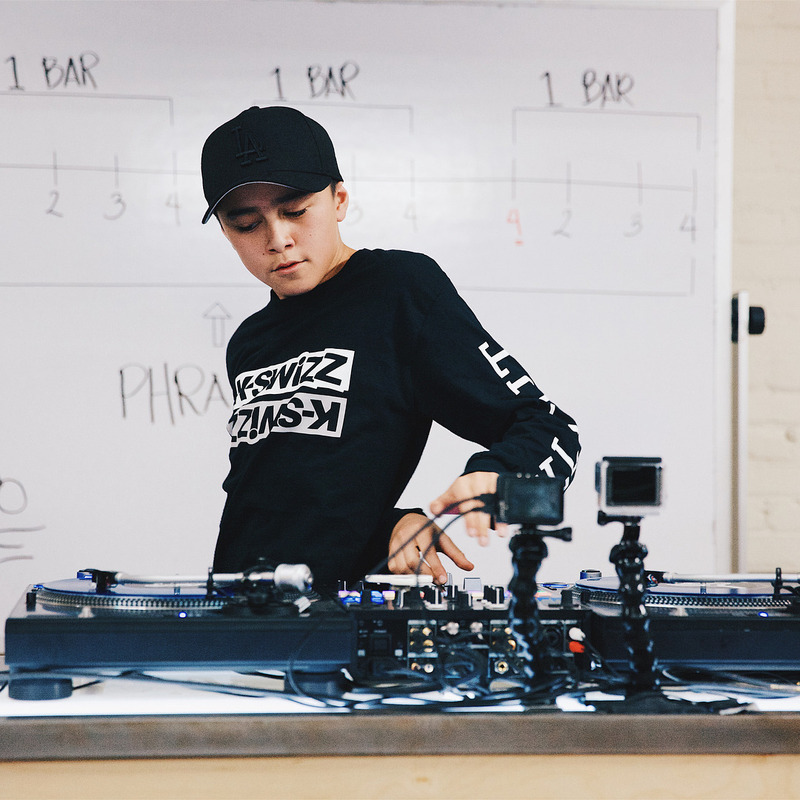 Late last year, Serato reached out to 3 individuals to help film a quick video, showcasing a live use of LINK (the new wireless midi protocol connection created by Ableton) which is now available in Serato DJ. The collaboration of T-Dot’s Finest repping for the Greatest Of All Time, The Notorious B.I.G. Dj Starting From Scratch takes you on the ultimate musical journey showcasing the greatest songs/features of Biggie & our very own Record Pool Ambassador, the legendary Dj Grouch gives you the ultimate retrspect by cutting up some of Biggie’s greatest Breaks/Breakbeats. All this combined gives you THE ABSOLUTE GREATEST TRIBUTE TO THE NOTORIOUS B.I.G. that you’ll ever get your hands/ears on!!! This is also our final send off to the G.O.A.T.! Kick back, relax, & enjoy this Final Tribute to The Notorious B.I.G. MARCH 9, 2017: 20TH ANNIVERSARY OF NOTORIOUS B.I.G. – TRIBUTE REMIXES/EDITS BY J.PERIOD, & MORE AT THE BEAT JUNKIES RECORD POOL! Today (March 9th) marks the 20th Anniversary passing of Brooklyn’s own The Notorious B.I.G. Many people will be doing tribute mixes & remixes for one of the greatest rappers of all time. We are lucky to have our good friend, the mixtape king & album producer, Dj J.Period send us some of his special remixes for our record pool. Make sure to go to www.beatjunkies.com & sign up for our record pool to get these exclusive J.Period remixes as well as edits from Dj Cyberkid, & of course The Beat Junkies. Description: Commemorating the 20th Anniversary of the passing of the greatest rapper of all-time — the late, great Christopher Wallace — J.PERIOD is proud to present the [MARCH 9 20TH ANNIVERSARY DJ PACK], a collection of 20 Notorious B.I.G. classics remixed for club, radio and mixtape DJs… and die-hard Biggie fans everywhere. One of our Beat Junkies Record Pool Ambassadors, the lovely & talented Dj Bella Fiasco put together a special mix called “The Message: A Beatjunkies.com Soundtrack”. Audio: The Magnificent DJ Jazzy Jeff Creates Chasing Goosebumps in 7 Days! Our big brother The Magnificent DJ Jazzy Jeff recently collaborated with some of your favorite artist and producers to create an album at his house in 7 days! When Jazzy Jeff hit’s your line, you make sure to answer the call. This was not your ordinary studio session where the artist has a few months to create and record and release. In the intro video, you hear Jazzy Jeff explaining that they are going to write, produce, record, mix and release a couple days after the completion of the project. R&B artist Glenn Lewis is the albums lead vocalist and will add his flavor to each track! Jazzy Jeff said that some of the music that is out these days doesn’t give you goosebumps when you hear the track, so the idea of this project is to chase those goosebumps. Chasing Goosebumps is available now and ready for you to listen and feel those goosebumps. What’s Good family, “Watch The Sound” is back! In this episode we feature the 4 X IDA World Champion, DJ IQ of the Handroids & Scratch Function LA. Check him out @djiqhandroidz. Dj Nu-Mark is back with his dope Zodiac Tracks Mix, and for this star sign he drops an extra lengthy one for all the amazing artist that are Aquarius! Download and listen to the Aquarius mix below on Dj Nu-Mark’s Soundcloud. Watch as Dj Nu-Mark live needle drop technique on this mix as well! To view the video of this mix on Dj Nu-Mark’s site follow this link! Here’s an event we recommend if you live in the Los Angeles area & if you want to hear progressive good music & enjoy good vibes! VIDEO SERIES: “WATCH THE SOUND” featuring DJ DOPEZ! Last summer the Beat Junkies were honored with an invitation to DJ Jazzy Jeff’s 2nd annual Playlist Retreat – a private invitational hosted by the Magnificent himself at his home in Deleware. Man. As you can imagine it was a beyond amazing week of collaboration and inspiration, all in the company of wonderful, talented people. One of the many highlights at Jeff’s retreat were the exclusive first looks at the newest DJ hardware from the music industry’s leading companies, which is where Roland officially introduced the new DJ 808 controller. I’ve been DJ’ing since 1988 and have always played on turntables throughout my enitre career. That being said, I have for years been reluctant to step outside of my comfort zone where digital technology is concerned. I’ve never played a set on CDJs nor been the least bit interested in making an attempt to perform on anything other than turntables, if for no better reason than sticking to what I know. However, thanks to the good folks at Roland, the Beat Junkies were gifted the new DJ 808 controller and were asked to choreograph a performance showcase on their behalf. As an artist, the last position you ever want to be in is unprepared for a live performance, so it was imperative that I learn the DJ 808 and had a thorough understanding of at least the very basic functions, for starters… Essentially this meant I would need to reprogram myself as a DJ in a few ways, probably the most significant of which was to acquire a feel for 2 jog wheels that do not move (as opposed to a motorized turntable). As with any new instrument, the DJ 808 can be intimidating at first glance – 4 channels, multiple effects, faders and buttons everywhere, a drum machine sequencer that syncs with your tracks.. It’s certainly a lot to make sense of all at once. However, after dedicating a few days of practice I was able to get comfortable with the general functions and overall feel of the unit, and within less than a week I was able to exercise all of my turntable techniques on the DJ 808 and felt confident I could compose a “Beat Junkie Style” set that would include both creative mixing and scratching. I have since had a few opportunities to showcase the Roland DJ 808 at various events, and other than “how do you like it?”, the question I get asked the most is about digital latency. To be completely transparent, there is a very slight adjustment that we as DJs need to make where hand control is concerned. Apart from that, the DJ 808 responds very well and is extremely accurate in translating DJ techniques. In fact, to all DJs worldwide, I can say with 100% certainty that the new DJ-808 is without a doubt worth consideration for everyone. Roland has created something special and is truly an organization that respects and appreciates the art of DJ’ing. Special thanks once again to DJ Descry and the entire team at Roland for continually creating new ways for us to play and make music. Let’s all keep an open mind where technology is concerned and keep pushing the art. ANNOUNCING THE BEAT JUNKIE INSTITUTE OF SOUND! SPRING 2017! Be on the lookout for the Beat Junkie Institute of Sound – a specialized DJ school and training facility located in Los Angeles brought to you by the Beat Junkie Crew.. Grand Opening Spring 2017! NEW VIDEO: “WATCH THE SOUND” Video Series feat. DJ DAY! In the spirit of Christmas, our very good friend, Dj Dstrukt showcases a special DJ showcase using the limited edition Serato Christmas Sweater control vinyl, as he flips his own versions of classic Christmas songs. Enjoy! Ho Ho Ho….Happy Holidays! Producer Extraordinaire Dj Exile of the mighty Dirty Science crew & his cohort, producer Sirplus, brings to you a special Christmas gift! For the next installment of “A Moment With” we spoke with D-Styles. His involvement with the seminal music collectives Invisibl Skratch Piklz + The Beat Junkies progressed DJ culture in the 90s + 00s, and he continues to pave the way for Turntablist / Beat heads as a resident of the long-running “Low End Theory” event based in Los Angeles. VIDEO: “BEAT DISCOVERY” – WATCH RUCKAZOID & TEEKO FLIP 15 BEATS IN 20 MINUTES! We the Beat Junkies are always looking for new ways to make music as well appreciating new techniques and this is something we think you should check out if you want expand on your repetoire. Ladies & Gentleman…..Beat Discovery! “If you make beats, then you’ve probably sifted through hundreds of sounds, loading them individually, only to program the same pattern you’ve made a thousand times. It’s extremely tedious, and can take the fun out of making a beat. Beat Discovery is the first drum sequencer of it’s kind, and was designed to solve this problem. It makes programming sounds fun, creative, and super easy. It’s easy for beginners & made for and by professionals. Beat Discovery was conceived and designed by RUCKAZOID and programmed with love by Leo Olivers of Mucoder. Check out Ruckazoid & Teeko make 15 beats in 20 minutes! “This past Sat. (11/19/16), I had the pleasure of spinning a special 45 set at the Soul Summit Dance Party – the Double Door in Chicago. To tell you the truth, I was kinda nervous because of the high caliber of talent that spun at this event that I had to live up to: my Beat Junkie brother J.Rocc, Breakbeat Lou, Peanut Butter Wolf, Prince Paul, Ali Shaheed Muhaamad (ATCQ), Dj Maseo (De La Soul), Adrian Younge, Rich Medina, Dj Spinna; you get the picture. So the whole week before my gig, I literally went thru all my 45 vinyl records to prepare for my set, & I tell ya, I was kinda overwhelmed….hahah! Our good friend Dj Nu-Mark does a monthly video showcase in honor of the characters of Horoscope. This episode of Zodiac tracks pays homage to: Pharoahe Monch, Scarface, Lou Donaldson, Diddy, Prodigy, Mobb Deep, Alchemist, Buckshot, Madlib, Oh No, EVE, Warren G, Monica, JRocc of The Beat Junkies, Bootie Brown of The Pharcyde, Phife Dawg and Minnie Riperton. The FB video will be up for a limited time so please share with the ones that count!